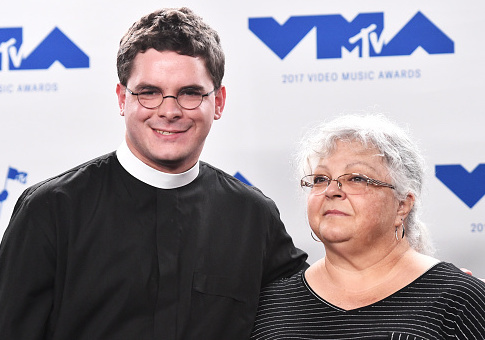 A descendent of Confederate Army General Robert E. Lee resigned as pastor of his church this week following his appearance at the MTV Video Music Awards, and subsequent concern expressed by congregation members. Robert Lee IV, the great-great-great-great-nephew of the Confederate general, was given a coveted speaking role last week at the MTV Video Music Awards where he spoke out against his ancestor. Lee called the Confederate general "an idol of white supremacy, racism, and hate." Lee, then pastor at Bethany United Church of Christ in Winston-Salem, N.C., spoke at the end of the awards show in a black cleric's shirt and collar, where he condemned racism, the Washington Post reported. "As a pastor, it is my moral duty to speak out against racism, America's original sin," he said. "Today, I call on all of us with privilege and power to answer God's call to confront racism and white supremacy head-on. We can find inspiration in the Black Lives Matter movement, the women who marched in the Women's March in January, and, especially, Heather Heyer, who died fighting for her beliefs." Lee's speech received applause from the crowd at the awards show, but some members of his congregation were not as receptive following the national attention the church received. Lee tweeted Sunday morning that he "had to resign [his] pastorate," and he wanted his followers to pray for him. He then quoted Albus Dumbledore, the headmaster of Hogwarts from the popular Harry Potter series, by saying there is a time when "we must choose between what is easy and what is right." Lee released an official resignation statement Monday and explained the reasons for the decision. My presence at the church as a descendent of Robert E. Lee and an outspoken opponent of White Supremacy had already attracted attention, but with my appearance on MTV the media’s focus on my church reached an all time high. A faction of church members were concerned about my speech and that I lifted up Black Lives Matter movement, the Women’ s March, and Heather Heyer as examples of racial justice work. I want to stress that there were many in the congregation who supported my right to free speech, yet were uncomfortable with the attention the church was receiving. The church’s reaction was deeply hurtful to me. Lee further noted his "deep love" for the congregation and expressed his gratitude for the church hiring him right out of seminary. He said, however, that when the church wanted to vote on his tenure, he submitted his resignation. The United Church of Christ has been known for its support for social justice issues, according to the Post. Confederate General Robert E. Lee became the center of a national debate in August when violence occurred between protesters and counter-protesters at a rally in Charlottesville, Va. The rally organizers, which included white supremacists and neo-Nazis, scheduled the rally to protest the removal of a Lee monument. During the event, over 19 people were injured, and Heather Heyer died after one protester mowed his car through a crowd of counter-protesters. This entry was posted in Issues and tagged Charlottesville, Racism, The Washington Post. Bookmark the permalink.